For much of the world, Iran’s 2009 summer of upheaval was an epic piece of theatre distantly observed. As citizens took to the streets in their millions to protest a stolen election and the regime that made it possible, and later, in smaller numbers, did battle with the shock troops of the Islamic Republic, so the country became effectively off limits for the world’s media. This dramatic confrontation – and the deep divisions that opened among Iran’s rulers as a result – have yet to be convincingly described for a Western audience. Afsaneh Moqadam observed and took part in the momentous events of that summer. Here, through the eyes of Mohsen, one of Tehran’s young, courageous protesters, Moqadam tells the story of these historic months, from the mass marches that greeted the disputed election results to their brutal suppression by the hated Basij militia – and a dark aftermath of imprisonment, torture and a show trial worthy of Stalinist Russia. 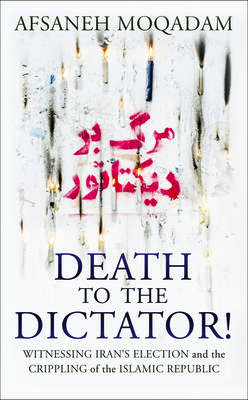 The result is an inspiring account of a confrontation that has signalled the fragility of the Islamic Republic and given pause to those Western leaders, notably President Barack Obama, who must grapple diplomatically with what may become the world’s next nuclear power. Above all, Death to the Dictator! is testament to the resilience of the human spirit, and its ability to strike fear in the hearts of despots.